The popularity of the program Downton Abbey shows that we are still fascinated with stately homes, along with the lives of the upper class and the servants who attended them. An inside look into this fascinating world is given in the book Rose: My Life in Service to Lady Astor by Rosina Harrison. First published in 1975, this is a lovely new edition of the book. Rosina (known as Rose) was born into a poor Yorkshire family in 1899. Her father was a stonemason and her mother worked as a laundry maid. They lived on land owned by the Marquess of Ripon and worked for the family. It is fascinating to read about Rose's early life and how difficult everything was -- from doing laundry to taking baths, everything was a complicated and back-breaking process. Rose knew early on that she would be spending her life "in service" -- working as a maid for a wealthy family. She did have some high aspirations, however: she dreamed of travel. Right away, she and her mother decided that she would attempt to get a job as a "lady's maid," assisting the lady or daughter of a stately house with dressing and other personal matters. Her mother advised that if she started out as a kitchen or housemaid that she would never be able to move up, so Rose stayed on at school for an extra two years to learn French and also worked with a dressmaker to prepare for her future career. 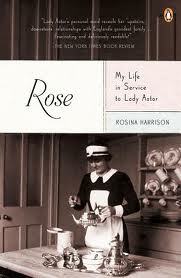 Rose was quickly hired as a "young ladies' maid" at a large house in London. She had never been outside her Yorkshire area before, but Rose described only excitement about taking the train to the big city. After a few years, she changed employers and was able to travel even more. It was during these many trips that she became acquainted with the Astor family, and their home at Cliveden. Lady Nancy Astor took notice of Rose and decided that she wanted Rose to be her maid. Already somewhat well-known for her outspokenness and demanding ways, Rose was reluctant to take the position. She did, however, apply for the job as maid to Lady Astor's daughter, when she found out the salary paid much more than her current position. Rose enjoyed her new position. Her charge was an 18 year old girl who was pleasant enough and wasn't demanding like her mother. As an attendant, Rose was able to travel with the family and was responsible for things like keeping the laundry clean, pressed and mended and keeping up with jewelry. Whatever it was that attracted Lady Astor to Rose was still apparent, because before long, Lady Astor demanded that Rose become her maid instead. Lady Astor got whatever she wanted, and this was no exception. Lady Nancy Astor had been born in Virginia and was already a divorcee with a young son when she married fellow American expatriate Waldorf Astor. She eventually became the first woman to serve in the House of Commons. Due to her connections to politics and society, the Astor house was frequently visited by politicians, writers, members of the royal family and other well-known personalities. As Lady Astor's maid, Rose was able to travel first-class, because she needed to be at "her lady's" beck and call. She had no social life, because of the demands of her job, but the excitement and unpredictability of her duties left her fulfilled. The majority of the book deals with Rose's observations about the spoiled and demanding Lady Astor. Surprisingly, Rose was never hesitant to speak her mind and point out her employer's faults, if she felt it was warranted. She was Lady Astor's maid for 35 years, so this frank quality must have been appreciated! She still showed great admiration for her employer, particularly during the difficult war years, when they endured bombings and bomb shelters together. The years after the war seemed to be Rose's favorite. She and Lady Astor travelled all over the world, and she was always given time to enjoy the places they visited. She had achieved her lifelong ambition. Thanks to Penguin Publishers, I have two copies of this fascinating book to give away! To enter, just leave a comment stating what household position you would want to take if you were "in service." Leave your comment by Jan. 24. I'll choose two winners at random. Winners must respond by email within 48 hours or I'll draw a new winner. This giveaway is open worldwide! Be sure and leave your email in the comment so I'll have a way to contact you. Good luck! Disclaimer: I received the review and giveaway copies of the book from the publisher. I would like to be the nanny. I would want to be a lady's maid or the chief housekeeper. If I were in service, I'd like to be a companion. Sure, pay me to be your friend! I would definitely want to be a lady's maid. All the intrigue! I was always rather taken with the idea of being a lady in waiting, I suppose it's not exactly 'in service' but it seemed like a pretty sweet job in general! I would be a cook.